The image of Yang Xiao Yun (Mrs Yang) kneeling on the ground begging a trader to spare a dog from being butchered for dog meat ‘gourmets’ at the 2014 Yulin “dog meat festival” was published worldwide and made her a celebrity. Mrs Yang made the journey to Yulin again this year to buy as many dogs as she could afford to save them from being brutally slaughtered. 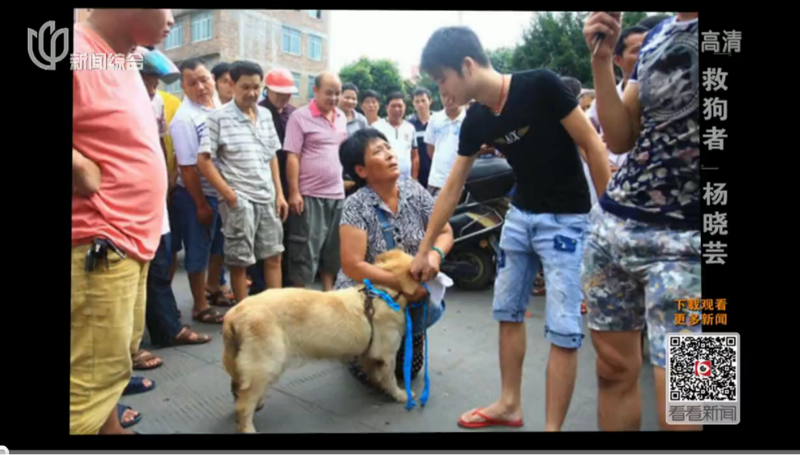 Brief introductory about Mrs. Yang, the photo of her kneeling down pleading for the life of the dog in last year’s festival made her well known to the people in China. Mrs. Yang is a dog lover and cannot stand how these dogs are butchered and sold in the Yulin market. She puts her own safety aside to voice her opinion, kneel down in front of butchers, stop trucks and rescues the truckload of dogs destined for the meat market. Last year, Mrs. Yang spent $150,000 Chinese Yuan to rescue 350 dogs and travelled for 3 days and nights to transport them back to her shelters in Tianjin. Mrs. Yang sees what she’s doing as normal, as she has been doing this and saving dogs for 20 years. She still gets emotional and is thankful with every truckload of dogs that is brought back to her shelter because they are now able to live because of her. The shelter where the dog was being lead into at the 1:43min mark has two areas, there is around 1000 dogs staying there. Many are rescues from the meat market, others are strays or from the city pounds. Mrs. Yang has 4 shelters like this in Tianjin, with a total of over 3000 dogs. Mrs. Yang says she is doing an immensely important service, but her neighbours does not agree. Daily quarrels are the norm, with reports filed against her. In the video, she was summoned into a police station, arriving there before 8pm and wasn’t allowed to leave until 11pm. This happened after a long day of transporting the truckload of dogs back to her shelter, which means she had no time to rest at all. She is forced to move within 3 months, she told the reporter there is nothing she can do. Mrs. Yang said she kneeled down in front of the dog meat butcher before and she will kneel down for her neighbour as well to beg not to be evicted. 3 out of the 4 shelters are taken care of by volunteers, only the abandoned apartment building that Mrs. Yang and the reporter was walking into is looked after by her as she lives there with all the dogs. The reporter was very shocked at the condition of the place as they entered and commented on the stench as they walked in, Mrs. Yang replied “this is where I stay, and how I live”, and the place has just been cleaned. Animal excrements, filthy water, worms and bits of rotted food is scattered all over the place mixed with the stench of 600 dogs in the building. There is absolutely no clean spot to be able to sit or rest. The media has previously criticized the state of the shelter and Mrs. Yang stating she cannot provide proper care for all these dogs since almost every month there will be dogs that are injured through fighting, illness then death. The reporter asked if Mrs. Yang has been bitten before seeing there is a big dog, Mrs. Yang replied “yes of course I have been bitten”. The reporting team thought this building is where Mrs. Yang looks after the dogs and after feeding, she is able to go home, shower, rest and sleep. They did not realise this is actually where Mrs. Yang lives, all by herself with 600 dogs. Seeing the many dogs in the room, the reporter asked don’t these dogs go onto your bed and defecate, Mrs. Yang replied “of course they do, things will just have to be washed”. The reporter then asked why doesn’t Mrs. Yang rent elsewhere, she said renting will cost her over $1000 Chinese yuan a month, she would rather use the amount on the dogs buying food and other necessities. It is absolutely unbelievable that Mrs. Yang has to live the way she is, not only is the condition filthy, there is also no bathroom or kitchen in that building. Mrs. Yang said “I have thought of giving up, but if I give up all these dogs will starve to death”. The 4 shelters is busting at the seams with over 3000 dogs, feeding them costs about 1 million Chinese yuan yearly. Mrs. Yang receives only about a couple of thousand a month of retirement payment, so had to be forced to sell her own home to continue caring for the dogs. After that money went, she had to mortgage her son’s property which resulted in her son not speaking to her for 3 years. Her daughter in law is also displeased about the situation since it is a house and not just some other unimportant item. They couldn’t win the argument with Mrs. Yang since she was very insistent and does not give up easily. A lot of people has tried to persuade her to stop doing what she does but she refuse to listen because she is stubborn. Mrs. Yang says she does not feel lonely, as there is 3-4 families living in the nearby abandoned buildings. One neighbour visits daily to help do the washing, as she says big sister Yang is exhausted so she comes to help. This lady and another neighbour are only a handful of volunteers that is helping Mrs. Yang. The young man with glasses and green t-shirt is also a volunteer and has been helping for 6 years now so is used to the stench and does not mind the filthy condition of the place. As this year’s Yulin festival is fast approaching, Mrs. Yang is also getting ready to make her journey there. First she had to go shower at one of the volunteer’s place and put on her best clothes, knowing the smell on her will not be welcomed on the plane or when she meets people. (In her younger days, looking good was actually very important to her, she was also a clean freak with OCD). Mrs. Yang receives a lot of phone calls daily leading up to the festival, a lot are from the dog meat traders who taunt her mercilessly that the dogs are all ready and to bring enough cash. In that account she has approx. $55,000 Chinese yuan, plus donations from various sources, she has around $100,000 Chinese yuan. Before Mrs. Yang started her journey saving dogs, she led quite a wealthy lifestyle. To get to Yulin from Tianjin, she has to travel by plane then bus. Away from her hectic life back at the shelters and her beloved dogs, she finally has the time to sit down and chat about her life, the heartbreak and setbacks she’s experienced. I had OCD when I was younger, so doing what I do now was a challenge. It was to the extent that every day when we woke up, blankets had to be brought out into the sun to air and get rid of odours. I used to mop the floor so clean that people thought it was waxed. You saw the photo of me when I was younger with my husband, he loved and treated me so well. For instance, he would not hesitate to buy the types of food that we like, doesn’t matter if it costs thousands or tens of thousands he would still buy it for me. Even though he liked the food himself, he would pretend he doesn’t and save it all for me. 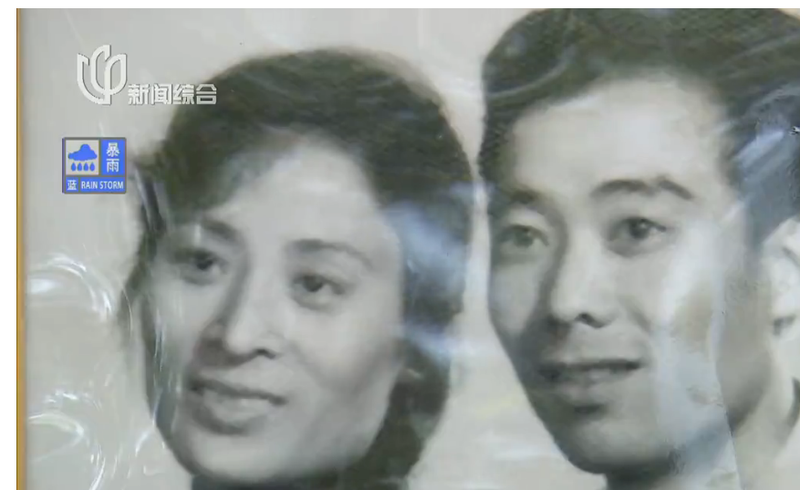 Mrs. Yang was very proud when she talked about her late husband. Unfortunately in 1995, he suffered from bleeding of the brain unexpectedly and passed away within 10 minutes. After he passed, for a period of time I was really…. I became emotionally unstable. I would sit at the front door waiting for him to come home “every day”…. Looking after pets became a way for me to occupy myself. Normal life has become a distant memory after her husband passed, Mrs. Yang focused her attention on her pets to help ease the pain and now, nothing can change her feelings, love and devotion for the dogs. So much so that when her grandson was born, she didn’t get the chance to visit. Reporter says, seems like you are willing to sacrifice anything for these dogs? “These dogs are saved, they aren’t being eaten and I would rather die and would willingly give my life in exchange for their right to live. I am not saying this just for show, it comes truly from my heart”. After the interview, Mrs. Yang met up with a few young people who wanted to go support her to save the dogs. They brought with them 40kgs of dog food. Mrs. Yang also praises an older gentleman, calling him the kind hearted person of Yulin that helps me. As this is the 2nd time going into the Yulin market, Mrs. Yang is better prepared not only mentally but comes with a plan wanting to secure a site where she can place the dogs that she is about to rescue from Yulin instead of having to transport them all the way back to Tianjin. Even though her plan is good, she was not able to go ahead because there is a school near the abandoned building. The reporter said to Mrs. Yang, it is already big enough a burden to care for the 3000+ dogs you have in your shelter, how are you able to afford to care for more? Mrs. Yang replied with: “take one step and look around before taking another step” meaning that she will just have to take it step by step to deal with the situation. On the morning of 20th June, two days before the festival, Mrs. Yang arrives early at the dog market. She asks the meat vendor what type of dogs are in the cage, and was told they are “Labradors”, which then Mrs. Yang said they are smaller in size compared to last year. The reporter asked, would people actually buy this type of dog and eat it? Reply was “all sorts of dog are available and would be eaten”. Mrs. Yang attracts a large crowd since everyone including the media now know who she is by what she did last year. People gossip among themselves saying this is Yang Xiao Yun, and she is here again. Maybe it’s because both Mrs. Yang and the meat vendors have had previous experience dealing with each other, or due to the fact there are local and international media around, tempers are kept in check better this time round. Even though it appears to be calmer on the surface, the people in the market still sees Mrs. Yang as a big threat, for it is their business and eating habits stemmed from hundreds if not thousands of years ago that she is trying to destroy. As the reporter interviews people in the crowd, their comments are that Mrs. Yang is not welcomed there since she is driving up the prices by the double for the dogs. Another man says she has not nothing better to do, why don’t the media go and report on stories like less fortunate people or child trafficking. Why bring all this unwanted attention from all over the country to their eating habits, since eating chicken, duck, and fish is cruel to. Dogs are what they like to eat, it makes them healthier and stronger. One of the dog vendors couldn’t help himself and started taunting Mrs. Yang asking her how many dogs is she going to buy, she replies “I will buy as many as I can”. The meat vendor continues his argument asking why dogs can’t be slaughtered for food, and says the disturbance Mrs. Yang brings with her and causing the dogs to double in price is a crime. He goes on to say dogs that are useless, or can’t be used to protect the household should all be slaughtered, which draws applause from the crowd. From the 4 days the reporting team spent with Mrs. Yang, they see a lot of contradictions in that she loves dogs so much yet she neglects her own family, she is rescuing more and more dogs, but can’t provide a better environment for them, she doesn’t have much money yet she strives to do more. Some people call her a hero, some say she should just mind her own business and she doesn’t have the right to force her own believes onto others. The reporter ends with not only is Mrs. Yang saving all these dogs, she is also saving herself at the same time. This woman is compassionate, kind and deserves our support. She lives in a culture that is cruel, vicious and power orientated. People like her make important changes in a world that is vicious and cruel and its people like her that get respect, not those cold cruel heartless butchers who deserve to rot in bell. LET HER GO! THE WORLD IS WATCHING YOU, CHINA!